Can you explain the explosion of social activities like text messaging with little or no promotion of the behaviour? How a Mexican wave happens? The emergence of online communities? Or more sensitively the steady rise of floral roadside tributes to traffic accident victims from complete strangers? Unless you have a good explanation of mass behaviour, youll have little chance of altering it. Herd reveals that most of us in the West have completely misunderstood the mechanics of mass behaviour because we have misplaced notions of what it means to be a human being. With a host of examples from Peter Kay and urinal etiquette to Apple and Desmond Tutu, Mark Earls offers the most new radical, controversial and significant new theory of consumer behaviour in a generation. "At one level a profoundly simple and important idea, that just happens to overturn everything we thought we knew about marketing to the individual." "Mark Earls helps us see clearly that we need to re-write the rules and provides us with a playbook for doing so. Are you ready for the we revolution?" 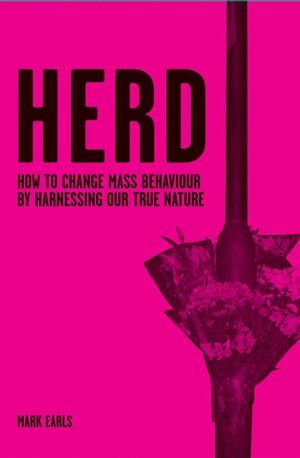 "Herd is a dazzling, nutrient-rich read that urged me to see afresh the big underlying forces driving media behaviour and why they especially matter now." "As important to read as Malcolm Gladwell and Adam Morgan were. I cannot recommend it highly enough unless you are a luddite or an ostrich." "Read this book. Think about it. If youre going to be any good at your job in the next 20 years then you need to questions your assumptions about how stuff works." Part One: A We-Species with an illusion of I. 2: The Illusion of I. Part Two: The Seven Principles of Herd Marketing. 4: Key Principle No. 1: Interaction. 5: Key Principle No. 2: Infl uence. 6: Key Principle No. 3: Us-Talk. 7: Key Principle No. 4: Just Believe. 8: Key Principle No. 5: (Re-)Light the Fire. 9: Key Principle No. 6: Co-Creativity. 10: Key Principle No. 7: Letting Go. Part Three: Making Sense of the Herd. And its goodnight from him . . . .
Mark Earls is one of the worlds foremost communications practitioners and a leading thinker about brands, marketing and consumer behaviour. He has been described variously as one of the Advertising scenes foremost contrarians and the Christopher Hitchens of advertising and marketing. But mostly he just refuses to accept received wisdom and is determined to make us all think a bit harder to get better results. He has held senior positions in some of the largest and most influential communications companies in the world - his last job was as chair of Ogilvys Global Planning Council, prior to which he was Planning Director at the revolutionary St. Lukes Communications. His work has regularly won awards from his peers and is considered by many to be amongst the most influential being written today. His first book, Welcome to the Creative Age, was widely read and discussed and has been translated into several languages. Mark is in much demand as conference speaker around the world in recent years he has spoken in the UK, USA, Argentina, France, Estonia, Sweden, Denmark, Finland and Spain. He lives in North London but dreams of tight lines, off-drives and sunnier climes.